One reason I loathe the current publishing system is the proliferation of supplemental figures: those figures that no one reads, but take lots of efforts to produce. I thought my PNAS paper was unusually bad when I had five main figures and ten supplemental ones, but I've noticed that that ratio is becoming routine. So in the tradition of hotornot.com, and my previous Nature vs Science, I'll pit Neuron and Nature Neuroscience against each other to see who's worse at requiring supplemental figures. 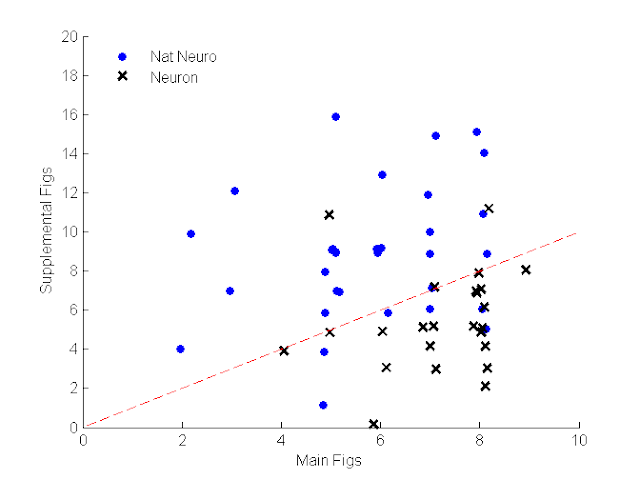 Number of main (x-axis) and supplemental figures (y-axis) for articles in recent issues of Neuron (black crosses) and Nature Neuroscience (blue dots). Dashed line is for main figs == supplemental figs. As you can see, Nat Neuro requires many more supplemental figures than Neuron (p<0.01, two-tailed t-test). On average, Nat Neuro requires 1.7 supplemental figurse per main figure, while Neuron requires 0.77. What can you conclude from this? Depending on your opinion of each journal's editorial rigor, and the Elsevier boycott, you should probably submit your first manuscript to Neuron. * While compiling these numbers, I saw the Mooney lab has a new paper. Goddamn his lab has been crushing it lately. They labeled specific cell populations using viruses (in the zebra finch), and showed that following deafening, only the striatothalamic (HVCX) projecting neurons underwent synaptic remodeling. In contrast, the motor-projecting neurons (HVC-RA), were stable. The striatothalamic pathway has long been hypothesized to be responsible for plasticity in the system, and this is the best evidence to date.